Address: 186 Victoria Parade, East Melbourne, Vic. 3002. 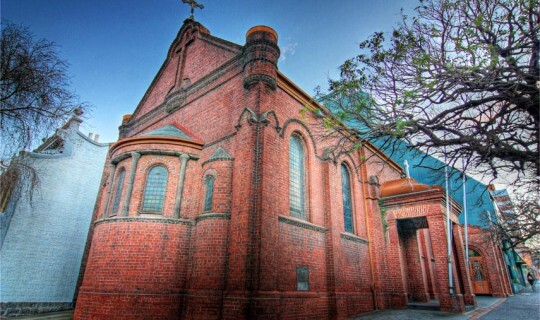 The Holy Church of “The Annunciation of Our Lady” is one of Melbourne’s oldest churches and is the second Greek Orthodox Church erected in Australia after “The Church of Holy Trinity” in Sydney. The first volume of the minutes of the Greek Orthodox Community of Melbourne and Victoria (GOCMV) makes detailed reference to the endeavours of the then members to collect the required funds to purchase the parcel of land in East Melbourne and to construct the church. Other articles related to the endeavours of the Greeks of Melbourne can be found in the archives of the “Argus” and the “Sydney Morning Herald”, newspapers of that era. In its infancy the church operated in a school hall (or ‘room’ as it is referred to in the first volume of the minutes) that the Community hired at Chalmers Church Hall in Gipps St, East Melbourne. The first official priest was father Athanasios Kantopoulos, who arrived in Melbourne with his family on the 22nd of June 1898 after a request from the Greek Community to the Patriarch of Jerusalem Damianos for a priest to be sent to Melbourne to serve the religious needs of its Orthodox residents. Prior to his arrival the Church operated in the aforementioned premises with Archimandrite Dorotheos “Samios “ Bakalarios, a visiting priest who arrived in Melbourne in August 1897 and immediately commenced services on the 22nd August 1897 (Now considered the date that the GOCMV was established). Archimandrite Dorotheos “Samios” Bakalarios remained in Melbourne until November 1897 and thereafter moved to Sydney where he continued to service the needs of the Orthodox faith in that city. The three founding members of the ‘Church Committee’, who played an integral role in the creation of Melbourne’s first Greek Orthodox Church, were Grigorios P. Matoorekos, Antonios J. J. Lekatsas and Alexandros V. Maniachis. A committee was formed at the General Meeting held on the 7th of March 1898 which took place at the business premises of Mr. Matoorekos. The immediate day after the meeting a letter was sent to the Patriarchate of Jerusalem which outlined the need for “spiritual guidance” and requesting the appointment of father Athanasios Kantopoulos to the Melbourne Orthodox Church. The matter of purchasing the appropriate land and additionally the construction of the church were discussed at the Community’s first General Meeting that took place on the 11th of September 1898 at 3:45pm at the hired ‘school room’ of Chalmers Church Hall. At that meeting it was decided that a fundraiser be conducted for the collection of funds required for the purchase of required land. Towards the end of July 1899 the committee found an appropriate allotment on the corner of Victoria Parade and Lansdowne Street East Melbourne “...the dimension of the land being 53 feet on the Lansdowne Street side and 89.5 feet on the Victoria Parade side”. The allotment was purchased by the three main members of the committee at the price of 600 pounds, “for the payment and to ensure the purchase of the allotment all three (Matoorekos, Lekatsas & Maniachis) contributed 160 pounds each, in total 480 pounds in the form of a loan at 5% interest per year. This amount, in addition to the 125 pounds contributed by members during the previous year, paid for the allotment of land thus assuring that a Greek Orthodox Church would be constructed”. Once the land was purchased, the owners of the ‘room’ at Chalmers Church Hall requested that the lease be terminated and as a result the Greek Community was obliged to seek another hall, that being Victoria Chapel on Grey Street, East Melbourne. With correspondence dated 8th of January 1900 the three committee members and the priest invited the Community’s members to its second Annual General Meeting, Sunday 14th January 1900. In the correspondence sent to Community’s members it was noted that the following Sunday 14th January 1900 after the church service a fundraising appeal would be conducted for the purposes of contributing funds for the construction of the Holy Church. As a result of fundraising, 257 Pounds was collected from the 55 members present. The foundation stone for the construction of the Holy Church of “The Annunciation of Our Lady” was laid on the 19th of December 1900, the celebratory day of St. Nicholas, in accordance with the Julian calendar. On pages 26 and 27 of Volume A’ of the minutes of the GOCMV, a detailed description is provided in regard to the foundation day event. “The priest Athanasios Kantopoulos blessed the land on Sunday 12 December 1900 and on the 19th of December the foundation stone was laid”. Amongst those invited were the following: “in absence of the Governor of Victoria, his wife, daughter and his adjutant, the Mayor and former Mayor of the City of Melbourne, all the consuls of European nations, other dignitaries and members of the Greek and Syrian communities.” The priest Athanasios Kantopoulos spoke in Greek and his speech was translated into English and distributed to those present. The Mayor of Melbourne, Samuel Gillot spoke as well as the Consul General of Russia. During the ceremony 155 Pounds was collected for the construction of the church. Messrs Inskip & Butler were the appointed architects and a tender was announced for the first stage of the construction of the church. N. Longstaff & Co were appointed as the preferred builders to the sum of 816 Pounds. According to the “Argus” newspaper in its edition on 22nd June 1901, the official opening of the church took place on Sunday 23rd June 1901. The “Argus” also noted that it would take a considerable amount of time for the works to be completed. Soon after however, a major dispute emerged between the priest Athanasios Kantopoulos and the committee in regard to the ecclesiastical jurisdiction of the church. Although the GOCMV minutes make minor reference, both the “Argus” in an article dated 1st September 1902 and the “Sydney Morning Herald” in an article dated 12th January 1903 refer to the differences that emerged in regard to which ecclesiastic authority governed the Holy Church of “The Annunciation of Our Lady”. The “Sydney Morning Herald” specifically notes in its article that for the past few months the Greek Orthodox church of East Melbourne has not been operating due to differences in regard to whether the church belongs to the Ecclesiastic Synod of Athens or to the Patriarchate of Jerusalem which was supported by Father Kantopoulos and a minority of followers. Furthermore it noted that a new priest had been appointed for Melbourne by the Archbishop of Athens. Finally in 1903 Archimandrite Nikandros Betinis who was appointed by the Holy Synod of Athens arrived in Melbourne. The Archimandrite Betinis’ birthplace was Zakynthos. The Holy Church of “The Annunciation of Our Lady” is one of the most important religious and historical monuments not only for our community but for the broader Greek community of Australia. By examining the church’s history one discovers impressive details of the life of the first Greeks in Melbourne as the Community and the church were the epicentre of the social and religious activities of the then Greeks.